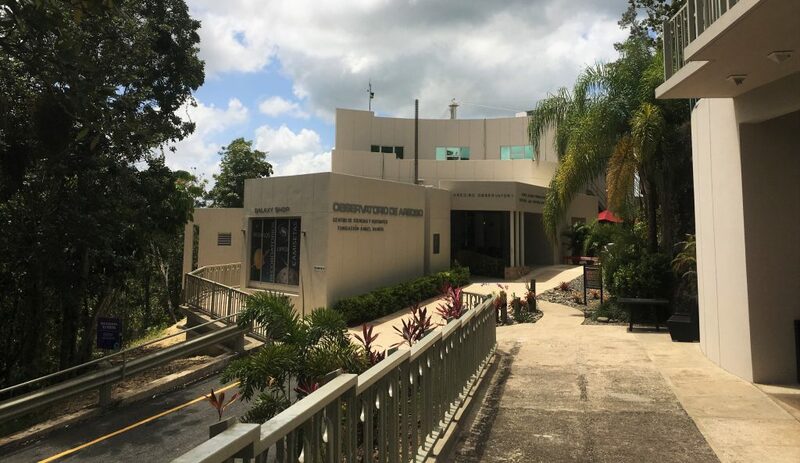 The Radio Telescope in Arecibo, Puerto Rico has been on my travel destination wish list for almost 20 years, ever since the Visitor’s Center was built in 1997. The Arecibo Radio Telescope was completed in 1963 after only 3 years of construction. It is a Scientific treasure and an impressive piece of engineering. I finally was able to explore the World’s Largest Radio Telescope mere weeks after it was no longer the largest – July 2016 China opened a Radio Telescope that is slightly larger, claiming the World’s Largest Title. 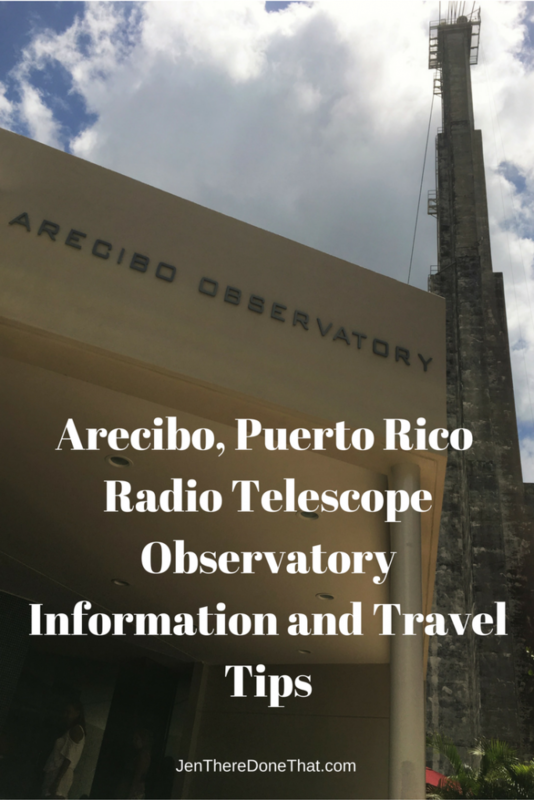 Arecibo Observatory is well worth a visit for anyone who loves science and engineering. Here is everything you need to know about the Observatory and how to avoid a Travel Disaster! Arecibo is a Radio telescope. It is not a solar or lunar telescope, so do not expect to see any planets. The telescope “views” objects by radio wave (sound) which is not visible. The circular floor (looks like a dish) does not move. It was built in a natural formation, which saved on construction costs and time to build. The Gregorian Dome reflector (looks like a huge golf-ball with a hole at the bottom) moves along the arc and pivots over the down floor. There are various antennae attached to the telescope for a wide variety of research. The Gregorian Dome and additional antennae were added as upgrades throughout the last 20 years to improve the research capabilities. Tours and documentary mini movie are available in English and Spanish. Tickets are purchased outside the Visitor Center, with discounts for Seniors and Children. Once inside, there is a two-story exhibit to explore some of the telescope discoveries, history of the telescope, and hands-on exhibits. My favorites exhibits inside are the wall of meteorite fragments from all over the world, Moon rock from the Apollo mission, and the history of the telescope photos. After exploring the exhibits, listen for announcements for the next mini-movie in the Auditorium (presentations alternate between English and Spanish, so just wait for the next presentation in your preferred language). After the 20 minute movie in the auditorium, visitors are escorted outside on the terrace to a spectacular view of the telescope. The tour guide gives a brief presentation and answers questions. The viewing terrace is outside. There is a cover for shade over some of the seating. The best view is not covered so wear sunblock, hat, and sunglasses if you plan to be outside for awhile. The researchers were repositioning the telescope during our visit and I was so excited to capture video of the movement! Watching the telescope repositioning movements is mesmerizing! We stayed outside for photos, video, more questions and just being impressed by the stunning views. Two story Visitor Center including exhibit hall, auditorium, and gift shop. Depending on your interest in the scientific discoveries, interactive exhibits, Q&A session, viewing the telescope itself, and time in (tiny) gift shop plan for 1-3 hours at the observatory. This was almost an epic FAIL. I purchased tickets for a special evening event (discovered on FB Page). Underestimating how horrible the roads were, we arrived 45 minutes into the four hour event, where we discovered a line of cars that stretched almost 2 kilometers from the observatory. Fifteen minutes passed, as well as an emergency truck, so we assumed a fatal car crash based on the horrific road conditions, and we left. There was no signal for our phone, so we could not call or check if there was an accident ahead. Instead we drove down the dangerous roads in the dark, taking twice as long as driving during the day), and were grateful to get back on the toll road. We went back the next morning and asked about the prior evening’s event. An employee finally confessed that they over sold the event, selling 800 tickets, and that people had to arrive 3 hours early to get a parking spot at the start of the event. Everyone else had to wait for those people to leave in order to park and attend the event. The emergency truck was there as a precaution only, since it would take responders a long time if there was an actual emergency. The event was poorly organized and there were no plans for additional parking for a special event, nor transportation for the hundreds of people that purchased tickets. The roads to reach the Observatory are treacherous, winding up and down the mountainside, often barely wide enough for 2 cars (head on collisions are the biggest fear on these tiny roads). There are no street lights and it is extremely dangerous to drive at night or in a storm. From the Arecibo exit off of the 22 highway in Northern Puerto Rico, it will take at least another 30 minutes to drive to the Observatory. There are signs at every turn to reach the Observatory from the Arecibo exit. Travel time from San Juan, Aguadilla, and other cities to Arecibo will take significantly longer, do not underestimate the traffic encountered while driving in Puerto Rico. The parking lot is tiny and looked like it holds about 30 cars. Visitors have to climb a steep 500-foot paved ramp from the parking lot to the visitor’s center. A (free) shuttle van can be requested to take elderly or handicapped people up from the parking lot. Closed all major holidays, plus Monday and Tuesday most of the year. Double check visiting days and hours before attempting the drive. Not suitable for most children 12 and younger, they will be bored. There are a few hands-on exhibits, but the majority of the facility is appropriate for teenagers (that really like Science) and Space/Science/Engineering geeks. Mobile phones do not work within a few kilometers of the observatory. At the lower parking lot, visitors are asked to switch over to airplane mode or turn off cell phones. Cell towers interfere with the telescope and cell signals are not allowed near the observatory. For Science and Engineering enthusiasts, the Arecibo Observatory is a must-see destination while in Puerto Rico! You are welcome. I hope you and your family get a chance to visit the observatory soon! I was going to visit Puerto Rico to take a couple of Caribbean cruises to the Eastern Caribbean Islands but after reading your posts I am discovering more and more about the Island. I immediately recognized the Arecibo Observatory from the Bond movie Golden Eye with Pierce Brosnan. For that reason alone I must visit. What an amazing structure! The only observatory I’ve been to so far is the one in Greenwich (London), but I’d love to see this one as well, if I’m ever in this part of the world. Watching the telescope move must have been an amazing experience, and definitely worth the wait in the sun! It sounds like something which would be really interesting to visit and learn more about. Such a shame that it took so much effort for you to get there in slightly dangerous conditions. You would think that they would have made more arrangements for parking once they realised they had over sold or at least put up some signs. However I am glad that overall you enjoyed your time there. The special events are poorly planned and I will avoid them in the future. But the regular tour is great and so worth the visit! Good to know how bad the roads are…I get motion sick on such roads and will make sure I pop a pill. The repositioning is so interesting…I was excited like a little kid while watching your video! Will put it on my list when I visit Puerto Rico! I really liked my visit to Greenwich Observatory when I was in London. So I guess this would be all the more interesting for me! The video is stunning, to watch the dome move, is so awesome! This is right up my alley way! I’ve loved reading recent articles about how sound technology is the way forward when it comes to space exploration. There’s so many things we can hear, but can’t see. What an awesome trip. It’s unfortunate the special event was oversold, though I can’t say it is a bad thing, so many people are willing to attend events like this. Definitely putting this on my nerdy bucket list! The Arecibo observatory is truly an engineering marvel. Obervatories generally evoke images of planets and galaxies, but it is nice you have exploded the myth. The fact that this is a radio observatory and uses radio waves is really information which is valuable to clear any misconceptions. However this in no way detracts from the attraction of the observatory. Hope to get there some day. I love science and engineering! This radio telescope was the LARGEST in the world for 53 years! It is responsible for many impressive scientific discoveries. Plus it is an engineering marvel! I bet the kids from my Science Club in high school would be so jealous! Supposedly the US Dept of Defense uses the Arecibo Observatory to search for UFOs too. I’m dying to come to Puerto Rico and check out everything! Arecibo used to the be place for SETI, before the SETI array in New Mexico. I think they are still involved. Never heard of it before, but def to be added to bucket list now! It looks like you can get a really amazing sight and well worth the drive. Sounds like a frustrating journey but I’m glad you made it through. The observatory looks super cool, this is a good alternative activity to do when visiting PR. Once we figured out to never attend a “special” event, the Observatory was an awesome experience. My husband will love this. I’ll be passing it on! How unusual. This was on my husband’s bucket list when we visited Puerto Rico. It was an amazing sight and well worth the treacherous drive. I wish we had seen the repositioning! The observatory looks wonderful, like something from outer space! I would definitely visit if nearby! Very cool! My dad is a huge radio history geek, so I’m shocked he hasn’t taken us there. I took my Mom and Dad to the telescope while they were visiting, and they really enjoyed it! The tour of the observatory was one of their favorite activities. I’ve never heard of this before! Crazy how unprepared they were, but I’m glad that it wasn’t a completely epic fail! thanks for so much honest info about this site! 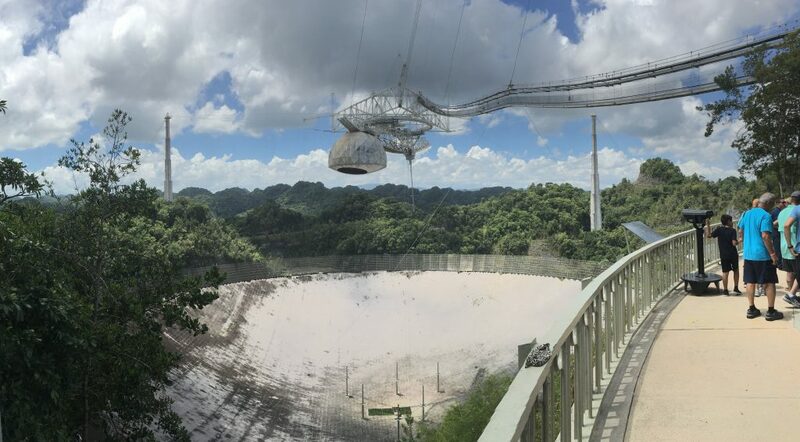 This was certainly never on my radar, and I had no idea that the largest radio telescope was in Puerto Rico or that it had lost it title to China. It certainly is beautiful and I’m glad you finally got a chance to visit! 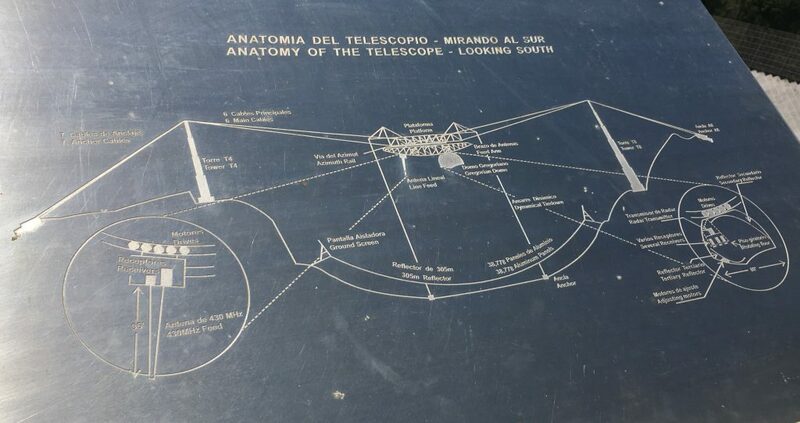 Despite the horrendous roads, I highly recommend a visit to the Telescope when visiting Puerto Rico! 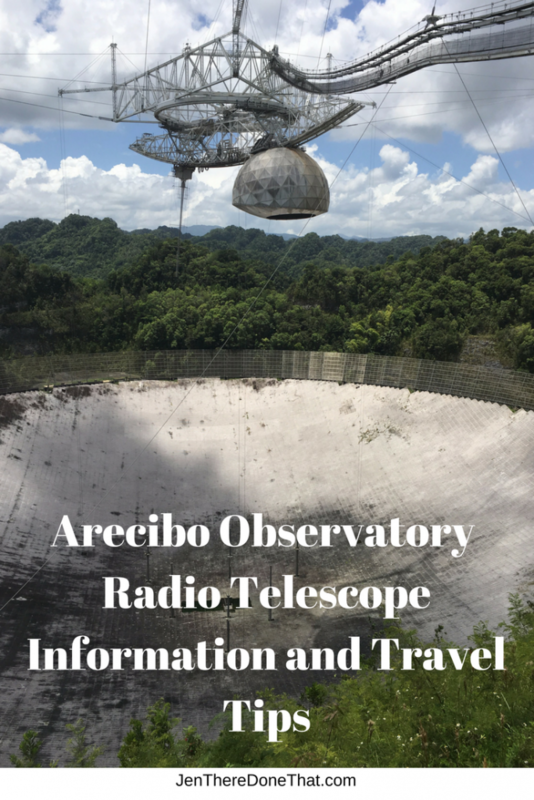 I never heard before about the Radio Telescope in Arecibo. Seems like a good place to check out when travelling to Puerto Rico. Thanks for sharing this hidden sight. Such great information. Glad it wasn’t completely an epic fail though those treacherous roads do NOT sound appealing that site sure looks amazing. Thanks for tips. Wow. That definitely sounds interesting. wow that radio telescope is amazing.